Your son and the heroes he's friends with will be ready to sneak around and get into huge, fun battles at his big birthday when you get items from the Ninja Party Party Supplies! You'll be able to find tableware items like plates and napkins, decorations like personalized labels and placemats, and lots more! Guests will never know what hit them! One minute they'll be in the car on their way to the celebration and the next minute they'll be covered in icing in the midst of a heated obstacle course. Whether you're throwing a surprise party or you simply enjoy the quiet danger of ninja warriors, this is the perfect theme for your next big birthday bash. 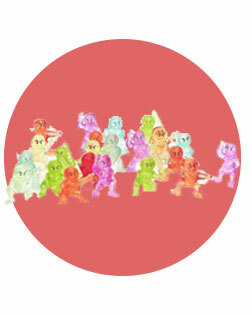 All of your guests will be slinking around the party just waiting to strike. Whether it's to grab that perfect piece of cake or to toss a gift onto the birthday pile, you'll be elated to have so many little ninjas to keep things interesting. o Be smooth like a ninja and have everything go off without a hitch at your child’s birthday party. The secret to party success is in the planning. Be sure to have essentials like games, food and goodie bags set up before all of your guests arrive. And it's always wise to have extras of everything. 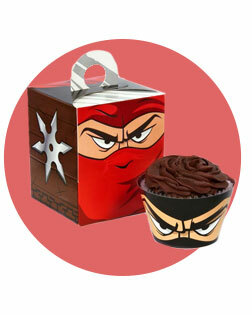 You never know when a little ninja with sticky fingers might come along and grab an extra cupcake. Looking for the perfect theme for a surprise party? Look no further. What could possibly be more fitting than a group of ninjas waiting silently in the dark to perfectly strike their target with the sights and sounds of a balloon release, confetti and kazoos! Get even more ideas on how to make your party memorable with tips from the Birthday Express Blog. The ultimate invitation will magically appear at the homes of all of your child’s closest friends. Sure, the USPS may offer a little assistance, but these ninja warrior invitations will certainly inspire the incognito spirit into everyone who receives one. Wouldn’t it be amazing if the moment you turned back to look at the blah party location it was already instantly transformed into a mysterious ninja den? 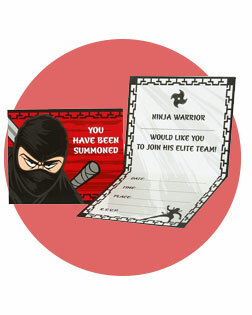 Recruit the help of a couple little ninjas and you won’t have a thing to worry about before the party starts. Your new tricks will take you to new heights just like these fun balloons take your party’s décor to new heights. Let them float above the gift table, cake table or to mark where the party entrance is. There is nothing incognito about putting your name in big bold letters, but your little ninja is so skilled that he has nothing to worry about. Fly his name high above the party entrance to let everyone know who is the leader of the pack. When you start your secret missions, you can make the banner the meeting spot for ninja headquarters or just revel in its special presence for your special day. 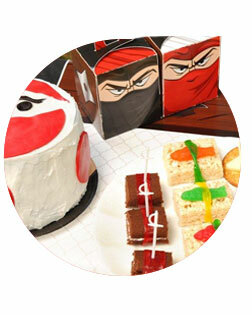 After all of that running, dodging, sneaking and hiding, your little ninja warriors will work up quite the appetite. Be sure to refuel them after all of their hard work and put in a special reward for a mission successfully completed. But just because the food will instantly disappear doesn’t mean that you don’t need to put forth the best presentation. While the food may go quickly, the tableware will stay in place, so create a stylish setting that will put a smile on those masked faces. The fun and games are never finished. Lurking in each corner is a new surprise that will stir up the energy in the room. The moment one activity starts to turn dull, a new exciting one is already there to replace it. Work on your reflexes with games that get your blood pumping or make it a game of wits and try to figure out the puzzle before anyone else does. Ninjas are smart, quick and nimble, so be sure to work out all of your assets to keep them sharp! Try your hand at sheer might with a ninja warrior piñata. With one swing of the ninja bat, each guest at the party will have a chance to break open the piñata to release the treasures that are hidden inside. You play the part, so why shouldn’t you look the part as well? Get outfitted with the ultimate ninja warrior costumes to feel like you are ready to take on any evil. Don’t let your guests leave empty-handed. After all of that hard work, they deserve an extra special treat. When they are on your side, you treat your ninjas with the respect and admiration they deserve. Make it simple by giving each guest a special party favor to help them remember this exciting day. Immortalize your day by keeping a ninja figurine as a token of all the excitement. As you gaze up at the tiny figurine peeking out of a space on your bookshelf, you'll be reminded of all of the amazing games you played on your big day as a ninja warrior. Too much candy is never a problem. Send guests home with an extra sweet treat with customized candy wrappers. Be the brave individual you are and stand out from the crowd with personalized party supplies. Show off your ninja skills by flying a banner high above other guests. Whether you flip, jump and rappel your way to the location is up to you. Guests will get a kick out of seeing your face underneath their pieces of cake. With personalized plates you can be in multiple places at once!